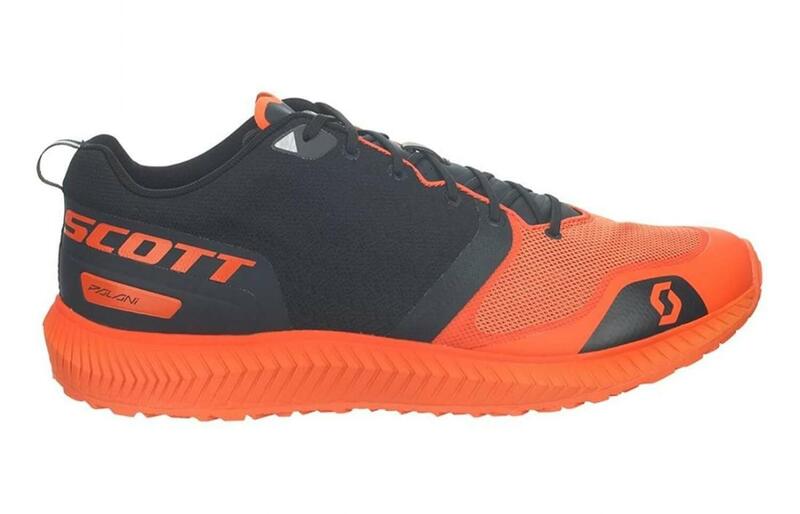 Scott Palani Trainer Review - To Buy or Not in Apr 2019? Scott Sports is a Swiss company, previously centered in America, which produces all sorts of athletic wear. Their primary focus is on bikes, ski gear, and motorsports equipment, but they have high-quality running shoes as well. The Scott Palani Trainer, or just the Scott Palani, is one of their main offerings. This shoe is focused on providing solid comfort and also has an emphasis on design and style as well. The Scott Palani Trainer’s outsole is made of a pretty standard blend of rubber. The rubber used does a solid job at remaining durable over long periods of time, but the real shine is the unique geometry of the outsole. Rather than utilizing tractioning lugs, like many other shoes, the Scott Palani uses a series of ridges throughout the entire outsole, which function like mini lugs. The advantage to this is better grip, without being as burdensome as lugs can be. This is a great plus for the shoe, allowing it to function well in both city terrains where lugs would be less necessary, and other terrains where lugs would be more beneficial. Apart from this, the Palani Trainer doesn’t have too many features on the outsole, but it still does a pretty solid job overall. The Scott Palani’s midsole is one of its stronger points, featuring pretty good quality materials and technology. The main material that makes up the midsole is a special foam called AeroFoam+. This material is great at absorbing impacts and shocks, returning energy, and is extremely lightweight. Additionally, the foam is more concentrated in the heel and gets less dense near the toes, to help distribute force in a more comfortable and effective way. This differing thickness is known as eRide and is supposed to promote a stride that is more efficient. The midsole is notably a bit firmer than some users might be accustomed to, but it still is quite comfortable all the same. Overall, the midsole does a great job of providing energy return and good cushioning, while also emphasizing an efficient stride. The upper of the Scott Palani trainer is also a strong point of the shoe. The upper employs a mesh design that is a bit more unique than other shoes. Towards the front of the shoe is a lighter and airier mesh. This makes the front feel less cramped near the toes and helps prevent sweat buildup towards the front. The middle features a more firm mesh, which is necessary for the twists and bends that occur as the foot is striding. It also helps to secure the foot a bit better as well. Finally, the heel area uses the rubber from the midsole, making it very stable and also durable. Atop the upper sit synthetic overlays, a common choice for uppers. These overlays serve to stabilize the shoe and foot from above, while not limiting the mobility offered by the mesh. Additionally, within the upper is a cushioned insole, which can optionally be removed. Finally, the material within the upper is also moisture wicking, to help further reduce sweat and potential odor build up. The upper is overall a very strong piece in the Scott Palani. This shoe weighs in at 8.5 ounces. This is extremely average for a shoe of this type, as many trainers tend to fall around the 10-ounce range as well. The weight is not really low enough to be considered lightweight or minimalist, but it also is not too heavy by any means. Overall, weight isn’t really a huge plus or negative in the Palani. Breathability is varied in the Palani Trainer, due to the various mesh designs that comprise the upper. The use of mesh throughout allows air to flow properly in and out of the shoe, as mesh is woven with holes that optimize circulation. The moisture wicking liner within the upper also helps with breathability Apart from this, the overall materials of the shoe are not too cumbersome, allowing for good circulation overall. The breathability of the Palani is pretty solid overall thanks to these components. Comfort is fairly strong in the Palani Trainer, mainly as a result of the midsole and the upper. The midsole adds to comfort through its AeroFoam+. As detailed earlier, the foam material is quite good at providing responsiveness and also gives a good amount of cushioning. The eRide, or different thickness levels of foam also are pretty comfortable, as they make the stride more smooth. The upper is comfortable thanks to several of the pieces that make it up. The meshes that it uses are all nice, as they are flexible and airy, two features that definitely help comfort. The synthetic overlays also add some comfort by stabilizing the feet, without being too restricting. Finally, within the upper, the moisture lining material and cushioned insole add some comfort to the interior of the shoe. Comfort is a pretty good aspect of the Palani Trainer overall. The Palani is generally a bit more like traditional trainers in terms of style, though it does diverge in some areas, giving itself a unique flair. The shoe has a very polished look, but still has the sportiness that has become common of many popular running trainers. Unfortunately, the Palani trainer does not have too many colors to choose from, and most of the colors it does have are very eye popping. This might not be an issue for some, but for those that prefer more discreet or casual looking shoes, it might be an issue. The shoe as a whole is stylish though, just not as usable for everyday life, due to its slight lack of color options. Durability is decent in this shoe thanks to its midsole, outsole, and upper. The midsole’s AeroFoam+ is pretty durable, and retains its shape and response well, even over long periods of use. The slight firmness of it helps a great deal with this. The outsole contributes with its rubber blend, which also is resistant to impacts, and can last a long time without wearing out. Finally, the upper contributes with its overlays and the strategic placements of mesh. The overlays make the upper more secure and less prone to tears. The thicker mesh and rubber at the back also help with this and make the upper less susceptible to any holes from use. These are the main features that contribute to durability in the Palani, and they do a solid job overall. The key components that affect protection in the Palani are the upper and the midsole. The upper protects the feet from the outside elements and does a good job of allowing air in, but other unwanted things like dirt and debris out. The midsole protects the feet with its cushioning, again thanks to the AeroFoam+. This material, though firm, does a pretty good job of absorbing and redistrbuting impacts. The eRide design helps with this, as well, by promoting a more efficient and safer stride. Protection is definitely adequate in the Palani Trainer. Responsiveness is highly dependent on midsole material usually, and this holds true for the Scott Palani Trainer as well. The Palani’s midsole is composed of AeroFoam+. As explained above, this material does a great job of returning energy, and the firmness of it is a plus to this as well. The thickness layers in the midsole also promote good responsiveness, by creating a better striding motion. This is pretty much the only factor affecting responsiveness in the shoe, but the Palani definitely does a good job in that department. For the support of the Palani, the midsole and upper play big roles once again. The midsole supports through the AeroFoam+ material. This material provides a solid base for each stride, and cushions and guides the foot very effectively. Once again, the eRide material plays a role as well, through its differing thickness levels, which also help support the foot from below. The upper helps to support the foot through its synthetic overlays. These secure the foot in place quite well, making for a very supported feel. Support throughout this shoe is fairly good overall. When it comes to terrains, the Palani Trainer is very well equipped. The tread like design on the outsole is a big part of this, as it affords a good deal of traction. It manages to do this without being overly burdening on city-like terrains. As a result, the Palani functions effectively on roads, sidewalks, grass, dirt, and most commonly ran on terrains. It performs slightly better than standard trainers in this regard, and is very well rounded. In terms of price, the Palani trainer is an interesting case. The shoe’s normal price point is fairly high, and on par with many other high-end trainers. On certain retail sites, however, it can be found for significantly cheaper. For the original price, the shoe is not a particularly great deal, but it does provide a good return on cost with quality materials and features. For the discounted price however, the Palani is a fantastic value. Overall, users will prefer to find the shoe discounted if possible, but if not, the shoe definitely is not a bad buy. As mentioned prior, the tread-like rubber on the outsole of the Palani is a great part of the shoe’s tractioning ability. This shape, in conjunction with the properties of the rubber allows for a good amount of traction on most surfaces. Similar to the differing terrains, traction will likely not be an issue for the Palani on most surfaces. The only things to watch out for are perhaps more extreme terrains or water. The shoe should be usable in rain though, with caution. The main piece that influences flexibility throughout the Palani is its upper. The upper is made of mesh, which, as explained above, does a great job of allowing flexibility and movement. Because it is woven, the material can twists in ways that solid constructions would not be able to. This is pretty much the only piece that affects the flexibility of the shoe, though it definitely does a good job. Flexibility as a whole is certainly sufficient in the Scott Palani Trainer. Stability in the Palani is heavily affected by the upper and the midsole. The upper adds to stability through the strong combination of its mesh and synthetic overlays. Mesh and overlays are a great combination for stability. This is because mesh provides flexibility, while synthetic overlays secure the foot very well, while not limiting flexibility from the mesh. The end result is a very stable and comfortable environment for the feet. Stability in the midsole comes from the foam. The foam helps to reduce the effects of harsh impacts and shocks, creating a smoother and more stable step overall. Stability is fairly solid in the Palani thanks to these features. The Palani Trainer’s drop is 11 mm. While this might be considered high for some minimalist shoes, for a standard trainer, this is definitely within an acceptable range. The drop is pretty average and is not really a major positive or negative aspect of the shoe overall. The Scott Palani trainer is a very interesting shoe overall. It has some pretty interesting and unique features, such as its versatility, and responsive design. For those looking for a trainer for most purposes, the Palani is not a bad choice. In particular, if found for the lower end of its price range, the shoe is a fantastic value. At the higher end, those seeking a budget shoe might want look elsewhere. Overall, the Palani is a solid and effective shoe.